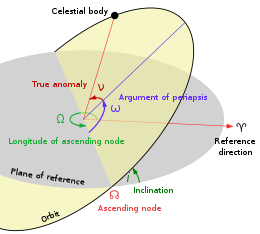 The ascending node is one of several orbital elements. An orbital node is either of the two points where an orbit intersects a plane of reference to which it is inclined. A non-inclined orbit, which is contained in the reference plane, has no nodes. For a geocentric orbit, Earth's equatorial plane. In this case, non-inclined orbits are called equatorial. For a heliocentric orbit, the ecliptic or invariable plane. In this case, non-inclined orbits are called ecliptic. For an orbit outside the Solar System, the plane through the primary perpendicular to a line through the observer and the primary (called the plane of the sky). If a reference direction from one side of the plane of reference to the other is defined, the two nodes can be distinguished. For geocentric and heliocentric orbits, the ascending node (or north node) is where the orbiting object moves north through the plane of reference, and the descending node (or south node) is where it moves south through the plane. In the case of objects outside the Solar System, the ascending node is the node where the orbiting secondary passes away from the observer, and the descending node is the node where it moves towards the observer., p. 137. The line of nodes is the intersection of the object's orbital plane with the plane of reference. It passes through the two nodes. Look up anabibazon in Wiktionary, the free dictionary. Look up catabibazon in Wiktionary, the free dictionary. (Unicode: U+260B, ☋). In medieval and early modern times the ascending and descending nodes were called the dragon's head (Latin: caput draconis, Arabic: ra's al-jauzahar) and dragon's tail (Latin: cauda draconis), respectively., p. 141; , p. 245. These terms originally referred to the times when the Moon crossed the apparent path of the sun in the sky. Also, corruptions of the Arabic term such as ganzaar, genzahar, geuzaar and zeuzahar were used in the medieval West to denote either of the nodes., pp. 196–197; , p. 65; , pp. 95–96. The Greek terms αναβιβάζων and καταβιβάζων were also used for the ascending and descending nodes, giving rise to the English words anabibazon and catabibazon. ; , ¶27. For the orbit of the Moon around Earth, the plane is taken to be the ecliptic, not the equatorial plane. The gravitational pull of the Sun upon the Moon causes its nodes to gradually precess westward, completing a cycle in approximately 18.6 years. ^ a b "node". Columbia Encyclopedia (6th ed.). New York: Columbia University Press. 2004. Archived from the original on March 9, 2007. Retrieved May 17, 2007. ^ a b c Darling, David. "line of nodes". The Encyclopedia of Astrobiology, Astronomy, and Spaceflight. Retrieved May 17, 2007. ^ Tatum, Jeremy B. "Chapter 17". Celestial Mechanics. Retrieved May 17, 2007. ^ ascending node, entry in The Encyclopedia of Astrobiology, Astronomy, and Spaceflight, David Darling, on line, accessed May 17, 2007. ^ Survey of Islamic Astronomical Tables, E. S. Kennedy , Transactions of the American Philosophical Society, new series, 46, #2 (1956), pp. 123–177. ^ Cyclopædia, or, An universal dictionary of arts and sciences, Ephraim Chambers, London: Printed for J. and J. Knapton [and 18 others], 1728, vol. 1. ^ Planetary Latitudes, the Theorica Gerardi, and Regiomontanus, Claudia Kren, Isis, 68, #2 (June 1977), pp. 194–205. ^ Prophatius Judaeus and the Medieval Astronomical Tables, Richard I. Harper, Isis 62, #1 (Spring, 1971), pp. 61–68. ^ Lexicographical Gleanings from the Philobiblon of Richard de Bury, Andrew F. West, Transactions of the American Philological Association (1869-1896), 22 (1891), pp. 93–104. ^ anabibazon, entry in Webster's third new international dictionary of the English language unabridged: with seven language dictionary, Chicago: Encyclopædia Britannica, 1986. ISBN 0-85229-503-0. ^ New thoughts on the genesis of the mysteries of Mithras[permanent dead link], Roger Beck, Topoi 11, #1 (2001), pp. 59–76. ^ Marcia Rieke. "Introduction: Coordinates, Seasons, Eclipses (lecture notes)". Astronomy 250. University of Arizona. Retrieved May 17, 2007.